In any production system with limited resources, the release times of work orders have immense effect on WIP, lead times, throughput, on-time delivery and overall resource utilization. The natural variation, the known variation among work orders, resource capacities, the existing workload, setups and batching are mostly responsible for delays in the flow of any work order. The problem is how to find right release times for work orders under the adverse influence of these factors. If jobs are released late, then on-time delivery, throughput and overall resource utilization may decrease. On the other hand, if jobs are released very early, then WIP and job lead times will increase. 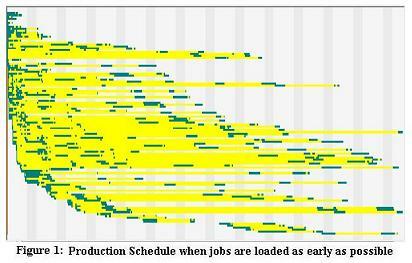 Figure 1 shows a schedule of 114 jobs consisting of about 1900 operations when jobs are released to shop floor as early as possible, that is, each job is released when the resources required for its first operation are available, ignoring the possibility of long job idle times before bottleneck resources. Each thin horizontal line represents lead time of one of the 114 jobs and a green segment in the line represents a time interval during which some work is going on for the job while yellow segment represents a time interval during which the job sits idle waiting for resources for some operation. This push schedule causes long lead times for many jobs and large WIP. The ladder-like patterns of green segments represent bottlenecks in the system. 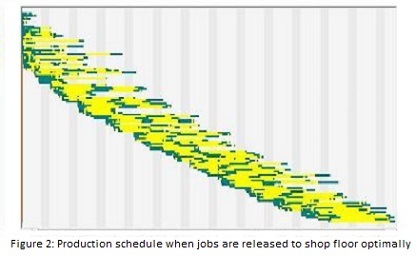 Figures 2 shows the schedule of the same workload on the same set of resources when jobs are optimally released to shop floor floor on the basis of factors listed in the first paragraph. To handle random variation within operation times and uncertain events, we can allow some idle time for each job on shop floor (without deliberately creating the idle time) as shown in Figure 2. Production becomes lean as shown in Figure 2 below when setup times are reduced and work orders are released at right times. We can expect reduction in WIP and lead times as shown in Figure 2 when we avoid the push system. Figure 2 represents potential benefit from any rational approach like Lean, TOC, QRM, finite scheduling, etc. In summary, job release times have immense effect on workflow, production control and shop performance.